VGM: What does ‘Daily hero’ mean to you, Nina, and do you consider yourself as one? Nina: A daily hero is definitely a positive person, someone who can dream big, whilst staying grounded and realistic. Moreover, I see women as daily heroes who are grounded, balanced, and stable no matter the challenges of daily life. Oh and in general I think mums are daily heroes. So if I took my definition of a daily hero, then I’d say yes, I am a daily hero, although ‘hero’ is a big word. I just think it would be important and simply beautiful, if all of us in this world knew who we really are in order to live an authentic life. Because then we are all daily heroes, each one of us individual and unique. VGM: What does your life as ‘Daily hero’ look like? Nina: I perceive my daily life as quite colourful and that’s great, because this is what I was wishing and working for. I need change and variety in my life, it provides me with inspiration and motivation. This means that every day looks different indeed, but I am in need of structure, too. So I aim to stick to a routine, like getting up at the same time everyday (of course there are exceptions to the rule), switch on my diffuser with one of my favourite essential oils, meditate for 10-15 minutes and practise yoga for about 20-30 minutes. Then I have breakfast and a shower, always finishing on cold. Only then will I switch on my phone and take care of any administrative things, such as writing emails, arranging calls and appointments, checking my social media notifications etc. Then I usually take care of different topics in blocks, for example yoga, where I experiment with new sequences, practise asanas and prepare a class or a workshop. Another block is mindset coaching, where I read up on exciting topics in relevant literature or magazines, listen to podcasts or get inspired by people who are already a step ahead of me. I also work with natural essential oils. I love the power of essential oils for their physical and emotional benefits. I try out new mixtures and share my knowledge with interested people internationally. In the evenings I teach yoga and during the day I often meet up with like-minded people for inspiration, exchange, co-working and potential cooperations. Tuesday is my Nina-day where I only do what I love to do spontaneously. This could be dancing bachata, going for a walk or scheduling a date with me at home. VGM: How do you inspire and touch people? Nina: I touch people with my openness and generous accessibility. I share a lot with others, and of course this makes me vulnerable, but I know I give others the opportunity, permission and the courage to do the same and to be open-minded. I love that! I inspire people with my courage and the brave decisions I have made, especially in the past three years, in order to live the life I truly want to live and that I have been wishing for from the bottom of my heart for quite a while. We can only be truly happy if we know who we really are. VGM: Which message do you want to carry out into the world? Nina: I would like to encourage everyone reading this interview: Be brave, connect with yourself, live your true self and you will experience lightness, happiness and love! VGM: If you could fulfil yourself one wish, what would it be? Nina: That I could be anywhere I want to be on this beautiful planet, no matter when, where and how. VGM: Who or what inspires you? 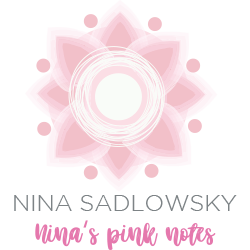 Nina: There are actually quite a few people and their stories that inspire me, for example JT Foxx, Tony Robbins, Gabby Bernstein and Elena Brower, but what inspires me most is travelling. Travelling is such a big gift for me! Travelling gives me the possibility to reflect, I receive so much energy and clarity out of it and I simply feel light and free. VGM: If you could meet one person, dead or alive, who would it be? VGM: Any situation that recently touched you and made you emotional? Nina: Yes, when my father spoke out an apology towards a person very close to me, an act of forgiving. I cried, since I felt so relieved, it took the weight off my shoulders. VGM: What do you do, if you don’t know how to progress in life? Nina: I breathe in and out deeply, I meditate. I cry. I dance. And I trust that all will figure itself out, once I let go. Because the universe has my back. VGM: Any wisdoms you would like to share with our readers? Nina: Oh yes, there’s actually quite a lot that helped me with my personal growth. But most importantly: before you start walking, take your time to be still, to simply be. And then you can walk off getting the life you truly want and wish for. Be brave and take risks in life. Develop a positive attitude to life, so if you have negative thoughts or feelings, redirect your focus on the good and beautiful things in your life and trust me, there’s loads. See every painful experience that you make in life as a sign to look into this in more detail and as a valuable possibility to learn and grow. Be yourself. Speak your truth. Be kind, ’cause life is too short not to sparkle with joy. Previous PostFrom beauty marketeer to wellness ‘guru’ Next PostSpirituality vs. party?